What fabric should I be looking for? What colors do I favor and wear more of? #1 – What colors should I buy for spring/summer pants? These solid colors give you the versatility to mix and match multi-colored check, stripe and plaid patterned shirts with your pants. Plus, you’ll be able to wear a less formal brown shoe. #2 – What fabrics should I be looking for? When selecting a fabric, you should always buy 100% natural fibers. For example, 100% wool breathes cooler than any possible blend of the 2 famous sisters: Polly and Ester (polyester). The performance of 100% wool is unmatched when it comes to maintaining a crisp crease. In addition, it has a natural ability to release wrinkles between wearings. #3 What colors do I favor and wear most often? Knowing the colors you prefer to wear gives you self-confidence in your appearance and a better idea of which colors to invest in. In order to gain real value for your investment, you should buy a rotation of 5 trousers at once. Buying 1 or 2 pairs of your favorite color men’s pants without a proper rotation is like buying a new pair of black shoes and having no other shoe to rotate. They obviously become your favorite, and they become worn out before you ever get a return on your investment. If you are not someone who will wear olive solid trousers but instead find yourself always reaching for navy (the old faithful), then it would be wise to purchase 2 pairs of navy pants at the same time. Then, rotate them properly for maximum value. It’s important to note that most retailers won’t recommend buying a second pair of your favorite color trousers. Instead, they will suggest a different color — which you may wear on occasion but not with the same frequency as your favorite color. Remember, the most expensive clothing you own is the clothing you never wear. 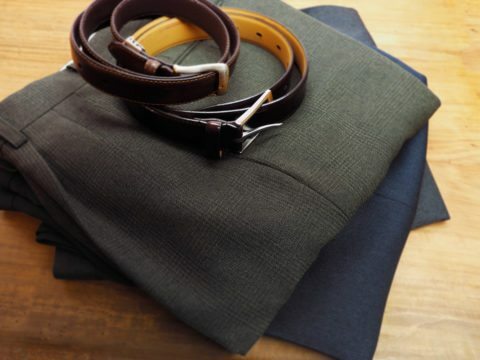 Don’t miss these 10 items every man should have in his business wardrobe.